Homer M. “Bud” Gable, age 78 of Carnesville, passed away on Wednesday, September 12, 2018. Born in Clermont, Georgia on June 2, 1940 to the late Warren and Nellie Mae Hill Gable. Mr. Gable retired from Mt. Vernon Mills after years of service. He was a hardworking man and loved his children and grandchildren. Mr. Gable was a member of Diamond Hill Baptist Church. 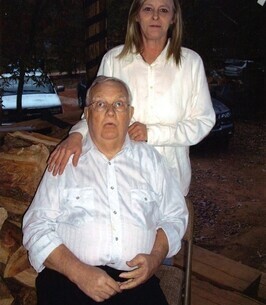 In addition to his parents, he was preceded in death by his wife, Debra Ann King Gable; daughter, Diane Gable Hart. Surviving are his sons and daughters-in-law, Clifford & Rebecca Gable of Carnesville, Melvin Gable of Cleveland, Wayne and Melina Gable of Braselton, Tony Gable of Alamo; daughters, Vickie Gable of Carnesville, Nancy Gable of Commerce; 12 grandchildren; 26 great grandchildren; 2 great-great grandchildren; brother, Junior Gable of Dahlonega; sister, Shirley Collins of Gainesville; several nieces, nephews, other family and friends. Funeral services are scheduled for 11 am, Saturday, September 15, 2018 in the Chapel of McGahee-Griffin and Stewart with Rev. Raymond Gunn officiating. Interment will follow in Diamond Hill Baptist Church Cemetery. To plant a tree in memory of Homer M. "Bud" Gable, please visit our Heartfelt Sympathies Store. We encourage you to share any memorable photos or stories about Homer M. "Bud". All tributes placed on and purchased through this memorial website will remain on in perpetuity for future generations.